The size of your Outlook mailbox increases as emails are sent, received, and stored. You may tuck email into folders manually (or by using QuickSteps) to help keep your inbox more manageable, but overtime these folders will become unmanageable. Keep your email under control, by setting up the AutoArchive feature in Outlook. The more email you have and store, the larger your Outlook file becomes, taking longer to access. If you find that your email takes forever to open in the morning, or you just can’t find what you’re looking for in all those subfolders you’ve created, then it’s time to turn on AutoArchive. AutoArchive allows you to manage and process your old email automatically, without spending hours sorting and deleting. You may set your settings to either archive or delete old email items, depending on your needs and preferences. Click on Folder at the top of Outlook. Click on the AutoArchive settings button. Select the option “Archive this folder using these settings”. Then, designate how often you would like the AutoArchive in months, weeks, or days. 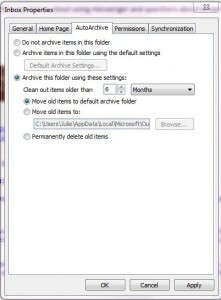 Either allow old items to be moved to the default archive folder, or choose a location where you would like your items archived to. 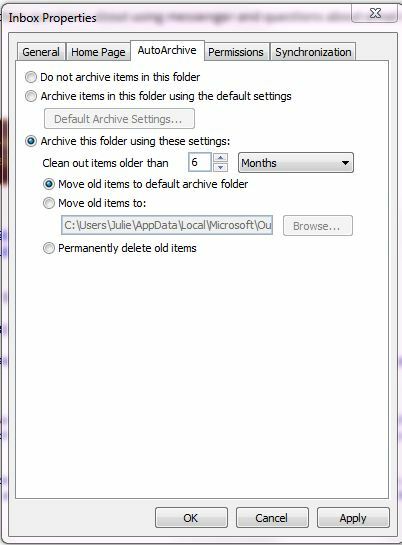 In Outlook 2010, the default archive folder will be listed under “Archives” in your folder list. To configure settings for individual folders (inbox, calendar, sent items, etc.) right-click on the folder, and choose Properties. Then click the AutoArchive tab. In Outlook 2007 and 2003, the default archive folder will be listed under “Archive Folders” in your folder list. Once AutoArchive is setup, it will help you keep your Outlook running its best automatically. Over time, if you find Outlook is slow to open, or your email folders are getting to large, revisit your AutoArchive settings and adjust as needed. And don’t forget to look in your Archive folder when locating an email that is older than the time specified in your AutoArchive settings.